One of the worst incidents to involve civilians during a Second World War bombing raid took place in South Hallsville School in Agate Street in Canning Town in 1940. For years, people believed that the highest number of civilian casualties in an air raid had happened in another area of the East End, when an accident at Bethnal Green tube station killed 173 people in 1943. The official casualty rates for the South Hallsville School bomb were 77, but it turned out years later that closer to 600 people may have died, making this the worst civilian tragedy of the war. The East End was heavily targeted by German bombs during the London Blitz, due to its docks and key commercial production. The area was heavily populated with locals living close to their places of work; many lost their homes and their lives as bombs rained down on the nearby docks and industrial targets. In September 1940, local residents were advised to take shelter in South Hallsville School, which had a useful basement that could be used as a bomb shelter. Many of these locals had lost their homes or seen them severely damaged. The building was being used as an evacuation point to get people out of the line of fire and into safer areas; however residents were left in the school for three days, even though it had been flagged as a potential target for bombing due to its location. Residents waited in the school, having been told that they would be evacuated from the area as soon as buses could arrive to transport them. There was, however, an administrative mix up and the buses went to Camden Town instead of Canning Town. Held up on their way back to the East End, the buses did not arrive in time to evacuate the school as promised. On September 10th, the school took a direct hit and was reduced to a pile of rubble. The whole school building fell into the basement, leaving hundreds of people dead, dying or trapped. The parachute bomb left a crater that was 20 feet deep on the site. Once recovery attempts were abandoned and all survivors who could be reached were rescued, the government released figures showing that 77 people had died in the bombing raid on the school. Locals disputed this figure for many years, and eye witnesses who had been in the building but left it shortly before the bomb landed estimated that up to 600 people were in the basement. However, they could not prove that casualty rates had been much higher in the face of official government denials, and not all of the bodies in the basement could be recovered to give accurate data on how many people had died in the blast. Moreover, it did not suit the British government to release details of such high casualties as this might have hampered their war efforts. As soon as the extent of the tragedy became obvious, the bomb site was cordoned off. Nobody was supposed to see what had happened and a press blackout was ordered so that newspapers could not report specific details about the incident, disclose the location where the bomb hit or print pictures of it. The war cabinet probably covered up the scale of the disaster in an attempt not to lose morale in the area and the country as a whole. The Blitz was devastating London day after day and people were finding it hard enough to carry on. The government probably also did not want to give the Germans such a massive propaganda boost by admitting that one bomb had killed hundreds of people. In 2010, papers in the National Archives painted a different picture to the official line. They seem to back up local residents who believed that the death toll was far higher than was reported at the time and show that the government opted not to release full details of what had happened. The bomb site at the school was eventually tarmacked over and another school was built on the site after the war in 1948. This school, Hallsville Primary, now has a garden and a memorial plaque on site that is dedicated to the victims of the raid. It is thought that the disaster at South Hallsville School may have forced the government to look at safer places for residents of the East End during bombing raids. Most had few options and congregating in larger buildings, like the school, was now obviously not a safe option. Five days after this bombing raid around 100 East End locals went to the Savoy Hotel and asked for shelter during an air raid as part of a planned protest. Other residents broke into tube stations and used those as shelters. 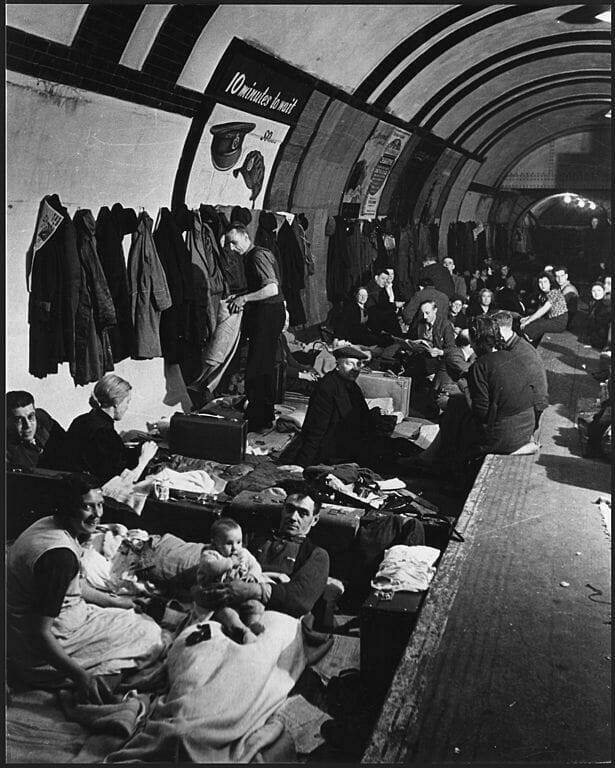 From this point onwards, tube shelters were opened up to locals as air raid shelters, potentially saving many lives. My mother in law died on the 2nd Jan – She survived the bombing; was pulled out after three days and thought it was angels taking her to heaven. Both her parents died, her farther’s death certificate recorded the date of death as September, presumably part of a cover-up. Her Mother died in the hospital a few hours after Nancy was rescued, without knowing that her daughter had been saved. I have just seem this and i am to young to know what happened at the time. However i was at hallsvile school when the queen re attened the school 50 yrs on. I was part of the BBC production covering the visit to the school and was part of a small group allowed to met the queen. Part of our production for the BBC and the queen registered the lose as over 740 lives. When the queen opened the second plaque at Hallsvile. We where also followed by the BBC as we attened the opening of the bliz experance at the war museum in central london. I lived in Granville Road and attended Hallsville School. Evacuation was made compulsory near the end of 1940, so my older brother and I were evacuated to Norfolk. My mother was able to accompany us as we had a babybsister under a year old. My dad stayed living in our flat as he worked at the docks. We heard about the school disaster but as I don’t know the exact date I don’t know if any of my school classmates were lost. Our flat was badly damaged so my dad moved what was left of our stuff to a house in Charford Rosd. I now live in Surrey. I was a survivor of hallsville school bombing, i was born in Martindale Rd in 1936. We were told the school was a point to get buses to be transported to somewhere? Buses did not arrive,so we bunked down in a corridor,i was with my father,my mother and sister and baby brother went elsewhere. Mother and sister killed brother badly injured but survived with shocking scaring to body leg and left arm.My favourite uncle Jim Dunsdon who was sleeping close to us was decapitated by falling steel beam. I got a cut to the head from falling debris. I wonder if there is any other survivors who i could contact,as it is on my Bucket List. be evacuated,the buses for some reason did not arrive .So we all slept in hallways and classrooms.When thhe bomb struck I lost my mother sister Irene and my uncle Jim Dunsdon. I was lucky I was with my father but still got a head injury,which was attended to at seamens hospital. I now live in Ballarat Australia and am 82 0n may 23. do you know of any other survivors that I could contact. After the bombing I visited Canning Town in search of my grandmother I am86 it must have been the rationing or the Sarsperella from the stall in Rathbone street that has kept us going. any gold in your garden? My great Grandmother was one of the victims….. My family ( the moor family ) later lived in Shipman Road Custom House and would often talk about the tragedy Because in the 1950’s The tragedy was still fresh in the minds of those who had lost loved ones …. My Mum and Nan lived in Lansdowne Road, Silvertown and went to Hallsville School for shelter from the nightly raid but it was full. A policeman who my Mother knew told them to go into the nearby Police Station and spend the night in the cells, which they did and it saved their lives and mine. My Nan reckoned there was more than 600 in the school that night but the casualties was all kept hush. A terrible tragedy! My Grandad had a barbershop in Landsdowne Road called Stan’s. Family got bombed out in 1940. Ring any bells for your family? I have just found this article and shown it to my mother who is nearly 96. She remembers having her first hairdo at Stan’s when she was 14 and went many times. I was 15 months old when my father was in Hallsville School when it was bombed. He was a RADAR man from Plymouth, in the Artillery, and he and number of Soldiers were awaiting being shipped out to India, Burma and Assam. He recounted rolling his bed when the bomb struck, which protected him. There were perhaps 6 Soldiers alive, one hanging with his ankles trapped between floor (?) boards. Their biggest concern was the smell of Gas but later he saw a ruptured Gas Main flaming down the street. He cut through a door with his Sheath Knife but found only a wall behind it. Rescuers did a “Silence for Rescue” call and heard the men, digging down and winching them out. He got 2 weeks compassionate leave and then shipped out. He survived and returned back to Plymouth after the War with the Burma Star. Pat Barker`s book “NOONDAY” has an account of this tragedy, though she calls it Agate School. My son (whose laptop I’m writing this on and who Googled it for me) lives in the East End on Roman Road. He can only afford to do that because he lives in an ex-council flat, where the bombs fell. I lived in Crediton Road and as kids we would climb the wall of the school beside the gate in Pacific Road. If our parents caught us we would get a clip round the ear because the bombed school was a special place. My mother was a “Fire Watch Warden” and she was on duty that evening being a local who lived in Clever Road. She always maintained that the number of people who lost their lives that night was far greater than the official figure suggested. One of the sorry memories that never ever left her was that of picking up the body of a little girl, and when my mother lifted her up, the childs head, arm & neck had seperated from the main torso and the rest of her body remained on the ground. Thank you Dave for your story. I would very much agree. Propaganda during WW2 was designed to keep Allied moral high and importantly deny the Germans information about bomb accuracy and deadly effect. There is a face book group regarding this . I went to hallsville , we all said it was haunted by the green hand! Could you give me details of the Facebook page please. I am currently writing a wartime novel based in Canning Town. I am including an account of this event. I would like as much background information as possible. I have been trying to find out anything I can on South Hallsville school, but it is not information that is readily available. does anyone know of a book on the history of the school is there a photo or picture of the school, can anyone tell me if the main gate was in pacific road, it would make sense to me given the information that I do have, can anyone help please.I have asked before but this time I would like to get a photo of the school. There was a gate in Pacific Road which was chained shut , but as kids we would climb the wall and play in the bombed building. If our par ants found out we would get right wallop and told never to go there again as the place was very special. It was many years later I learned of the true background as to how special it was, as those bodies that could not be recovered were left in situ and quick lime poured over the site and the ground later levelled and covered with ash from Beckton Gas Works. Before the new school was built. Hey, there is two. Now the main gates are split in two. One close to butchers road for the jounior school and the other the far end of radland road closer to st lukes cathloic school. The pacific road gate was always closed during my time there in the 80s to 90s as the gravel pit as we called it was classed as dangerous after the “aspestos” scare of the late 80s and very hot indian summer. The gravel pit was known as the area the old school building had been buried under before building the two newer seperate buildings that house the students now. The boys used to have to use that area to play football during PE. But the surface was so harsh it was like razer blades if you fell on it. The BBC covered footage from out raged perants my mum included after independant results produced differant results then the newham council published. The familys lost the case however the council fenced off the area and closed the gate on pacific road forcing familys to walk the full way round to drop their childen to school. I have been trying to find out anything I can on South Hallsville school, but it is not information that is readily available. does anyone know of a book on the history of the school is there a photo or picture of the school, can anyone tell me if the main gate was in pacific road, it would make sense to me given the information that I do have, can anyone help please. My Mum used to tell us the story of the school receiving a direct hit from a bomb. The story went that her family had been allocated beds at the school but when they arrived someone had taken their places. My grandfather was angry but said his family should leave and go to a nearby air raid shelter. That move saved their lives as the school was hit that night. Another unrelated story you may be interested in is the strange spooky things that happened in our flat in More Close. Both my sister and I experienced what seemed to be a person dying trapped under something heavy and struggling to breathe. This was quite terrifying in the dark alone in the bedroom. We both had the same experience more than once. We wondered if our flat had been built on a street previously bombed. Our Mum said the flat was built on Scott street which had been bombed. I’d love to know if that was true. My Mum and her sister who had twin girls were supposed to go to the school to wait to be evacuated but there wasn’t enough room for them all. My Mum wouldn’t leave them. She always said that the true number of casualties was wrong. She thought that hundreds had been killed. When a national newspaper published details, I was horrified. I was also quite relieved that my Mum had passed away. I think she would have been absolutely devastated to learn the truth. So much heartache and suffering is difficult to imagine. I would like to hear the truth about the Hallsville school disaster, My parents died not knowing the truth. My dads mum (my nan) was killed in the bombing. I can remember them telling me that families were told to go to the school because they will be safe there. please if you know what actually happened I be most grateful. As an 8 year old I can remember walking from North woolwich to Canning Town on the morning after the Saturday air raid to visit my grandparents in Malmsbury road. The road was still on fire from the fats from Loaders ,the standard telegraph works and other factories having spread across factory road and the railway.the house in Canning Town was deserted and we were told to go to hallsvile road( The H being dropped made it allsville road) but was eurned away by the police.They had done a “moonlight flit “to Oxford. Tracing my family tree, I found out my Fathers cousins family were nearly all killed in the raid on South Hallsville School. Father (Edward Glitz), Mother and four of their 5 children. Their 2 year old, Jane survived and was reunited with her Granny a few months later. The story of the reunion featured in the December 6, 1940 edition of the Daily Mirror on page 2. I grew up in Murray Square, moving in when the estate was first constructed around 1950/51 or so. We played in the ruins of the school – only ever known to us as ‘the bombed school’. We only played on the outer parts of the school, I think the core of the buildings was boarded off. We rarely stayed long on the site because of the eerie feel of the place. We grew up believing the site to be haunted. We never knew how many people died there only that it was many families sheltering from the bombs. As a side bit I went to Clarkson St. school in Rathbone St. When that street was still a market. Thank you Malcolm for these historical treasures. Hallesville School going on to Ashburton. Now in Brisbane since 1948, Iremember my mother trying to visit her parents after the raid. She came home in tears saying that they had sheltered at the school & we never saw them again. She believed they were in the mass grave under the ruins. I visited the new school in 2000 & was given a friendly reception by current staff & saw the wall tablet given by the Queen Mother.The bitumen surface over the bomb site is eerie when you know the history & I was told that the night cleaner staff believe it is haunted. R.I.P my grandparents. My Mothers home was bombed on the first night of the blitz. She was almost 10 years old at the time. Along with my Grandmother and her siblings they took shelter in the garden anderson. There was a second family in the same shelter. When the bomb destroyed the house,(in Queens Rd) the rubble fell on top of the shelter trapping all inside. Fortunately, my Grandfather had built the shelter with a second exit at the rear which enabled then to be rescued. During the next few days they took shelter in Hallsville School. My Grandfather (ARP) took them all to another nearby school just an hour or so before it was hit. I assume, because of the ‘cover up’, there seems to be no records of any bombs dropped in that area. My mother is now almost 85 but remembers the event like it happened yesterday. Hello Steve, thanks for that great story. Yes I would imagine a lot of “bad news” was covered up during the war to keep moral high and also importantly to confuse the Germans with regards to their bombing accuracy. My family lived in Poplar during WW2. My father and grandfather (both dockers) had built an Anderson air raid shelter in the back yard. The air raid warden came to my grandmother’s house and asked that the entire family be moved to the nearby school because an air raid was imminent. My grandmother refused saying she had an Anderson shelter. That night the school was hit by a bomb. My family was OK as it took refuge in the Anderson shelter. My grandmother said it was the worst death toll from a single bomb in London in WW2. I never knew the name of the school but suspect it was South Hallsville school. Many thanks for your great story. I can remember as a child in the early 1970s my next door neighbour still had his Anderson shelter in the back garden. I wonder how many people are still alive today thanks to those shelters. i am still here, aged 86, thanks to the Anderson shelter we had in our backyard in Granville Road, Canning Town. We used it all through the blitz, and I remember, when we heard a bomb whistling down, my Dad saying “This one’s ours – this one’s ours!’ Fortunately we never received a direct hit, though our flat was badly damaged. I was evacuated shortly afterwards to Norfolk, but my Dad moved our furniture to an empty house in Charford Road and continued to work in various docks around the country. Both my parents lived to their eighties. I went to Hallsville School before we were evacuated, and have often wondered if any of my old school friends were there that fateful night.